It’s easy to get hung up thinking about advanced ways to make sounds and effects, but often it’s the gesture and the way that sounds change over time that creates the most interesting effect. This is why you’ll often find experienced producers obsessing about sequencer features. The control voltage inputs on modular synthesizers provide opportunities for the unexpected and can add complexity to an otherwise fairly simple sound generator. 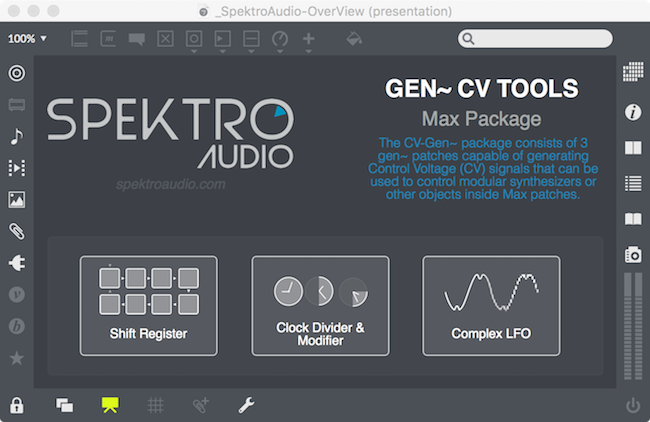 To help scratch the itch for modulation, control voltage aficionado Ícaro Ferre has created a small package of Gen CV Tools. These can be used as CV signal generators for your Max synths or you can route it to a hardware modular using a compatible audio interface. Because these tools are all built with Gen, you are invited to dig in and get inspired to think about how you might create your own CV signal generators by altering the patches. Included Snippets also make it easy to drop these tools into your existing patches and Max for Live devices. Find the Gen CV Tools exclusively in the Max 7 Package Manager.